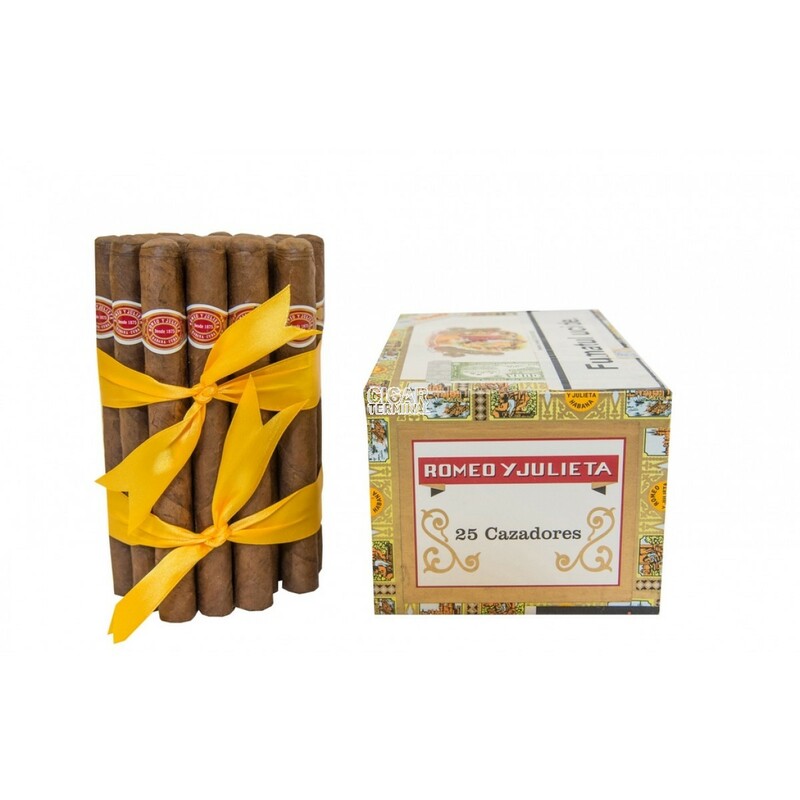 The Romeo y Julieta Cazadores is a Cuban classic, a powerful and spicy Lonsdale, 6.4” (162mm) long, of 43 ring gauge, and comes in a 25 cigars box. • Pungent aromas of coffee and leather with strong tobacco, earth and toasted spice. • Black pepper pounds the palate. Arguably the strongest cigar coming out of Cuba. A great digestive paired with Armagnac. Bold oak presence suggests that this cigar is high in carotene a foretelling sign of great aging potential. A great burn with a firm draw. Starts out with a shot of toasted black pepper, tobacco with some dry espresso and some cocoa. Earthy. More pepper, gets stronger in the hay, exotic spice, bitter coffee. Leaves the lips a slight touch salty. All out strong pepper, coffee and spice. Requires at least 10+ years of age to reach its finest. Buy a couple of boxes and set them aside. Smoke one every six months after the first year and see how the flavors mature. You’ll be tickled pink. In summary, strong but classic old-school Cuba. These are billed as "Old School Cuba." They are a nice flavorful smoke. I have had a little difficulty getting the draw to free up on them. I do not like to fight with a cigar and the lonsdale vitola is sometimes a challenge. They are not overly complex, but are good smoke for the price point. After reading reviews that this was 'one of the strongest cigars out of cuba' I thought, 'i have to have some'. Very good cigar, HOWEVER not even close to strong, I would give it medium at best. Aroma in box was insane, grass, ammonia, barnyard, leather, vinegar. First light was full of cedar but not strong, cigar evolved from cedar to cedar and grass and a bit of the pre light barn yard smell...thats it. All together a great cigar, but for price I would go with something else. Sancho Panza Non Plus is an ocean deeper than this cigar and the Partagas Petit Corona Eapecial is a solid 10 times stronger and 4 times deeper, both are significantly cheaper. 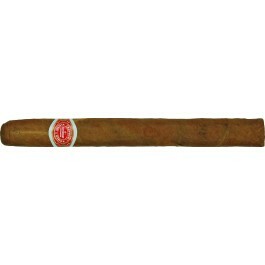 Romeo y Julieta Cazadores is strong upon first light, but settles down into a smooth but full flavor body. The best flavors come through the nose. Fairly strong cigar, but I like my sticks that way. The box I got was perfect and though I know most put these down for a couple years, I smoked one right off the truck to see where they were at. Perfect construction and smoked beautifully, when I was finished I had three long solid ash chunks and a small nub. A testament to the cigar itself, but also how much care is taken in packing and shipping of the cigars from cigar terminal. Possibly the strongest Havana in production today. Brutal when young, but after a while, showcases the RyJ line with quality tobacco, flowers and even hints of fruit. I have read many reviews of this cigar, and figured I'd try it. I had one from LCDH and really enjoyed it, and bought 2 boxes from my friends at CT.
After a brief rest in my humidor, then dry boxing it for 3 days, I lit one up last night and it was terrific. The cigar itself seemed somewhat hard and dry, which caused me some concern, but when I cut into the cap I smelled some barnyard and dark earth, and when I lit it up it drew perfectly and was a very well made cigar, needing only one small tough up through the end. The flavors are very strong and complex, with subtle changes throughout, and a gradual strengthening with spices, pepper and cedar. Glad I got 2 boxes, and will put one down for 4-6 years if I can resist temptation.